Operator-Safe O&M for Wastewater Pumping | Smith & Loveless Inc. Submersible pumps sit confined in a deep, dark pit of raw sewage. Maintenance requires the buddy system, special equipment and lots of ibuprofen. 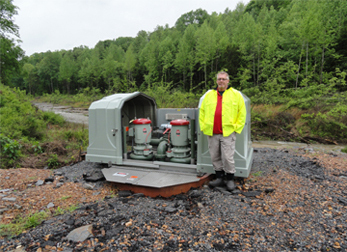 S&L Non-Clog Pumps, operate inside our Wet Well Mounted Pump Station that sits above grade. Maintenance requires just one person, some ordinary tools and your buddy is only there to give you the latest football scores. Offering the safest and most operator-friendly pump station access on the market, S&L EVERLAST™ Wet Well Mounted Pump Stations are inspected and maintained without the requirements typically associated with confined space entry, like permitting, harnesses, gas monitoring equipment, multiple personnel, and other OSHA and Class 1 Div 1 requirements. All pumps, valves, controls and piping located at ground level. Routine O&M tasks like pulling a pump to change a pump seal or impeller can be completed without costly contractors or pump maintenance centers. Work safely above grade, without harnesses or breathing equipment. Optional Fall Protection also available. Sewage is in the wet well while you work on the pumps. These operational advantages lead to three times the service life and 50% less O&M costs than submersibles – verified by a real world case study.